Once you receive notification that the domain you want to analyze has been crawled, you can begin using the software. Depending on the size of the domain, the computational analysis may take anywhere from a few minutes to a few hours. 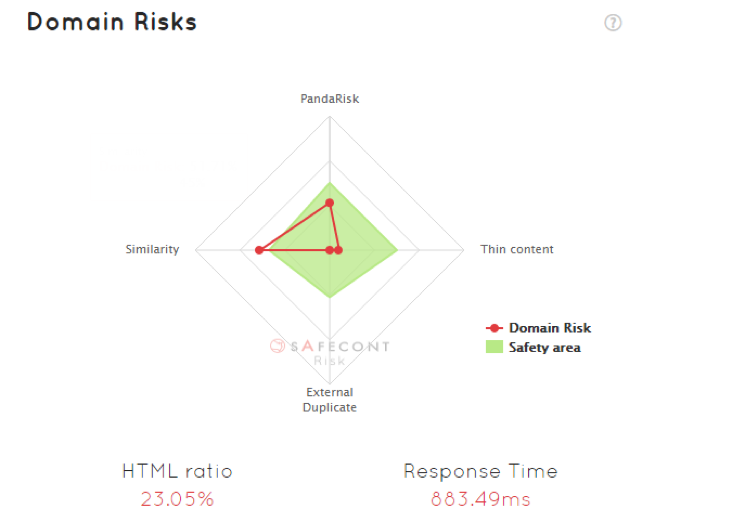 PandaRisk: This is the score Safecont assigns to a domain based on the risk it runs of being penalized by search engine algorithms. This score ranges from 0% to 100% – the closer to 100, the higher the possibility of penalization. Low risk scores are shown in green, intermediate scores are yellow or orange, and the highest risk scores are shown in red. PandaRisk is calculated based on numerous factors including internal similarity, potential thin content problems, external duplicate content, etc. (Many other correlated factors are also involved in this calculation, but it would be rather complicated to show them all here). PageRisk: This is the score Safecont assigns to the webpages/URLs within the website under analysis based on the risk they run of being penalized by search engine algorithms. This score varies from 0% to 100% – the closer to 100, the higher the possibility of penalization. 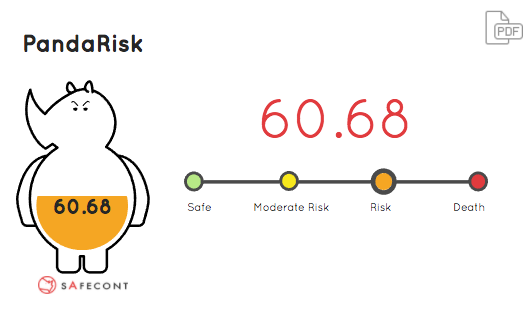 Low risk scores are shown in green, intermediate scores are yellow or orange, and the highest risk scores are shown in red. PageRisk is calculated based on numerous factors including internal similarity, potential thin content problems, and external duplicate content, etc. (Many other correlated factors are also involved in this calculation, but it would be rather complicated to show them all here). Ultimately, PageRisk provides a more focused, page-by-page view of the general vision provided by PandaRisk. Similarity: The webpages/URLs in a website may have content in common with other webpages/URLs within the same site, either duplicate or very similar content (which also poses a high risk). The term similarity is therefore more complex and involved than the more common term “duplication”. 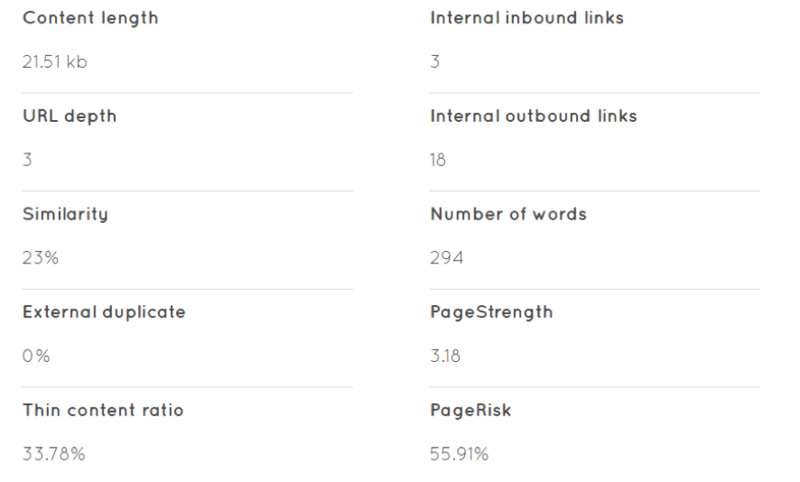 PageStrength, LevelStrength and LinkStrength: These are measurements of relevance at page, web depth, and link value levels (comparable to the Pagerank). These are primarily used for web-scale architecture. Cluster: This is a set of webpages/URLs grouped according to certain common patterns. Different groups can be formed based on recurring or potentially dangerous problems detected. These groups can be further divided and classified according to potential risk levels, thereby making it easier to target the website’s potential problems. 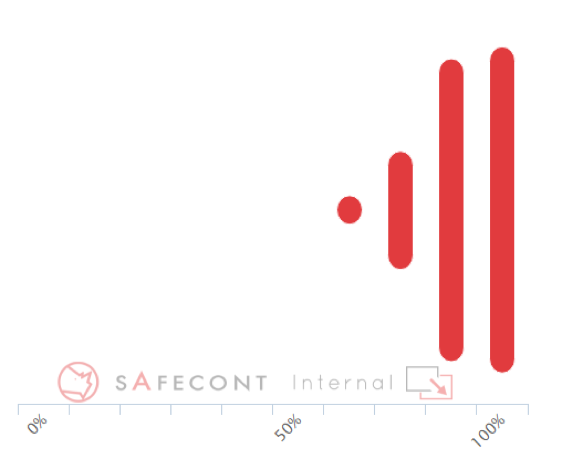 For example, Safecont displays a cluster of the most dangerous webpages/URLs within a domain and assigns them a risk level, thereby allowing you to focus on which pages are the most dangerous and why in order to take appropriate action. The Home tab provides a summary of the domain’s general status and main problems. The idea is to gather and target all the points that require immediate attention in a single tab in order to improve your website. This will allow you to respond in a more concise manner and, more importantly, prioritize the tasks at hand without wasting time. The first tab shows the number of URLs that have been obtained after crawling the domain. The only way to determine this exact number is by crawling the site, otherwise you would just be estimating. This explains why some analyses may take longer than expected, although that is not usually the case. You can also see the date when the analysis was launched. This date can be used in order to make a comparison between analyses of the same domain during different periods of time. The rhinoceros shows the domain’s general PandaRisk, with colors corresponding to the colors on the side bar. Green means that the domain has very few (if any) content-related problems. Yellow suggests that you might have to take action in order to clean up some dangerous clusters (pages grouped according to specific patterns), similarly to the color orange (which would require more in-depth cleaning). Red generally means that the domain is very dangerous, requiring immediate action. Here, you can see data grouped in order to go directly to the problems. 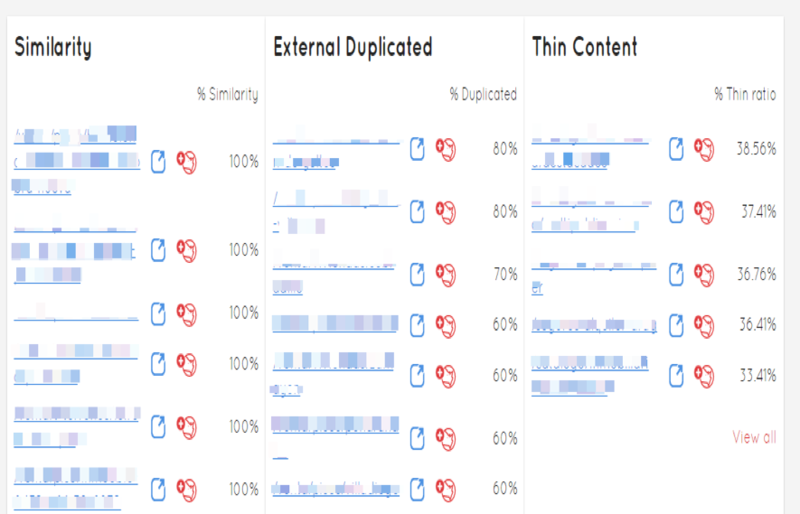 Main problems: This shows the number of pages that have problems of thin content, similarity or external duplicate content. If you click on the name of each problem, the link will bring you to the corresponding tab. So if you click on similarity, it will take you directly to the “similarity” tab, where you will find the most dangerous clusters due to similarity and a list of all the webpages/URLs within the website ordered according to risk level (this way you do not have to waste time identifying the most dangerous pages, which will appear at the top of the list). Spider graph: This graph shows that when parameters are within the green zone, the website domain has a low risk of being penalized. If there are any points outside this area, you should first focus on the website’s most immediate problems. Remember that the graph does not show all the factors involved in calculating the PandaRisk and the PageRisk, but the most important thing is to focus on the most immediate problems. 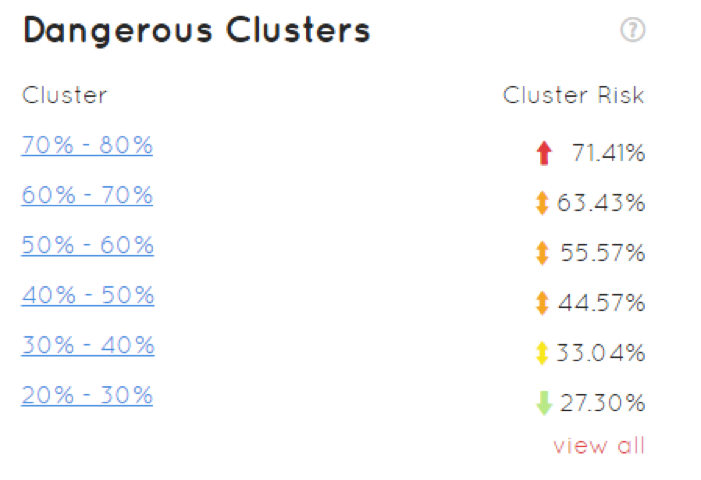 Dangerous clusters: These are the groups of webpages/URLs that present the highest risk of being penalized and, therefore, involve a higher level of risk for the entire domain. They are grouped according to 10% increments of risk, indicating the average risk for that cluster (grouped by common patterns among webpages/URLs). These clusters are ordered from highest to lowest level of risk; in other words, the clusters at the top of the list require the most immediate attention. 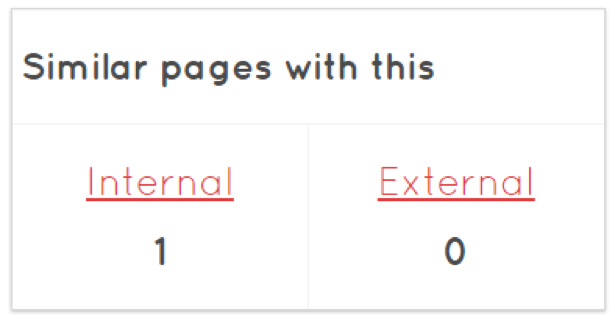 If you click on the percentages, you will be taken to a specific page for that cluster showing all the webpages/URLs involved, and you will be able to see the main problems for each page and their PageRisk score. Furthermore, if you continue clicking on each URL, you can see the specific problems associated with each page (for example, duplicate pages, thin content ratio, depth level, etc.). Visual dangerous clusters: This graph complements the above list of dangerous clusters and shows the risk level and size (number of webpages/URLs) of each cluster by means of bars and colors. In other words, a very long green bar suggests that a significant number of the website’s URLs have very few problems (if any) in terms of content-based penalties. Therefore, if the graphs (always try to use the same graphs for each cluster) form a pyramid with the base on the left-hand side, your domain is apparently safe; however, if they form a pyramid with the base on the right-hand side or towards the right of the center of the graph, it means you have a lot of work to do. By clicking on the different bars, you can see the details of each bar and go to that specific cluster. It is highly recommended to take immediate action for any values in red (which are the most dangerous). 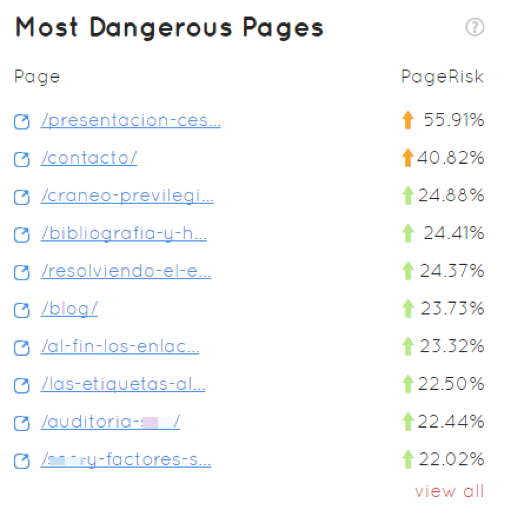 Most dangerous pages: This is a list of the most dangerous pages within the website, showing the most dangerous pages at the top of the list. If you click on the pages in this list, you can see the details for each page and a plethora of data to help you troubleshoot the problem. By viewing the Home tab, you will immediately see: the domain’s general risk level, main problems, the most problematic clusters or groups of pages, and the most problematic specific webpages/URLs. 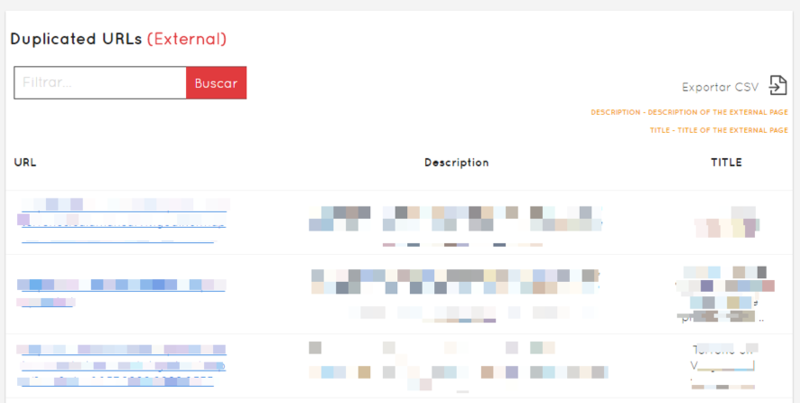 In other words, you can easily view the entire website’s status in just a few seconds, as well as where you need to start working in order to improve it, if necessary. The circles below show the domain’s average values in terms of similarity, duplicate content and thin content. Below these values, you will see a complete list of webpages/URLs organized according to their risk level based on similarity, external duplicate content and thin content. The URLs are listed in order, meaning that the URLs at the top of the list have the highest values of similarity, etc. It is therefore highly recommended to start working on the URLs at the top of the list. If you click on the URLs listed under Similarity, a list will appear with all the URLs that show similarity with the URLs you previously clicked on, and if you continue clicking on the list that appears, you can see the details of each URL and whether they have a high degree of similarity with other pages. Similarity issues may lead to problems of possible penalization and decreased optimization of the website’s resources, both in terms of content and architecture. By clicking on the URLs for external duplicate content, you can see all the pages that have content similar to yours, as well as a description and title in order to target who is copying your content and take appropriate action based on their niche, etc. The thin content column shows the ratio of thin content for each webpage/URL. If you click on these pages, you can see which pages are in danger of being penalized (even if they don’t have a high thin content ratio) as well as numerous other details. Similarity clusters: This is a set of pages grouped according to the percentage of similarity shared with other pages in similar ranges. For example, you will find pages with similarity ratios of 80%- 90% in the 80%-90% range. If you click on the percentages, a dropdown menu will appear showing the pages with those similarity ratios and their corresponding PageRisk, so that you can determine which URLs require the most immediate attention. If you click on these URLs, you will see the details of each page. It is important to emphasize that not all the pages in the same cluster are necessarily similar to each other, but they do have at least a similarity of such value with another URL within the website being analyzed. External duplicate cluster: This is a set of pages grouped according to the percentage of external duplicate content shared with other pages that do not belong to the same domain. For example, you will find pages with duplicate values of 80%-90% in the 80%-90% range. If you click on the percentages, a dropdown menu will appear showing the pages with those similarity and external duplicate ratios and their corresponding PageRisk, so that you can determine which URLs require the most immediate attention. If you click on these URLs, you will see the list of all the URLs that have relevant external duplicate content, as well as their corresponding descriptions and titles (without having to leave the platform, thereby facilitating your work). PageRisk clusters: This is a set of pages grouped according to their respective PageRisk ratios. Pages with a PageRisk of 80%-90% are grouped in the 80%-90% range. 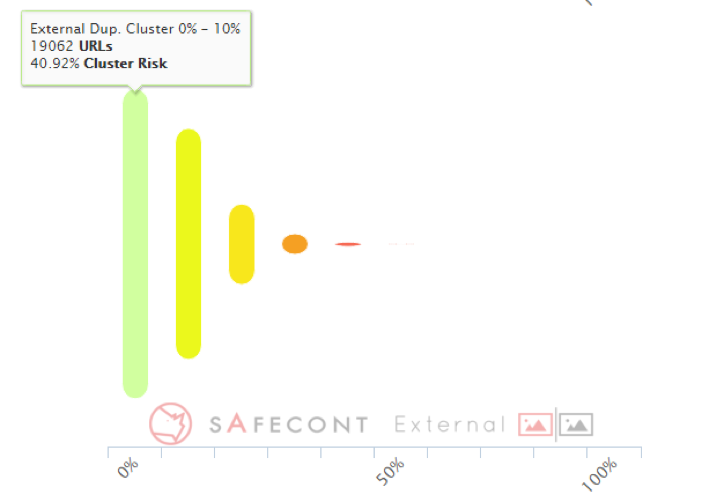 If you click on the percentages, you will be taken to a specific Safecont page that first shows the pages with the highest degree of risk within the entire cluster, followed by the URLs within the cluster and their specific corresponding risks (you can also click on the link for each URL to see more details). This shows a list of webpages/URLs from highest to lowest PageRisk in order for you to determine which are the most likely to experience a decline in traffic or be penalized. If you click on each URL, you will see the details for each webpage, showing the Pagerisk indicator on the left and a danger warning for said page on the right. Below you will find the general details, which are very useful when comparing with other pages if there are any problems. You can view “Similar pages” on the right-hand side, which shows the number of pages (if any) that have similar content to the page being viewed or external duplicate content (if you click on these pages, you will see the details of each page, which can then be opened in your browser for comparison). Depth levels: You can view the website’s depth levels at a glance from the homepage all the way through to the last page in the website. Appropriate architecture foments adequate link juice distribution between different levels, as well as the different levels between pages. An inadequate distribution, links that do not link properly as they should, and pages with poor quality content, duplicate content, or very similar content can all lead to inefficient internal links, thereby resulting in an inefficient final ranking leaving room for improvement. Level 1 is the homepage (you can click on the bar in order to see the homepage details). Level 2 includes the pages that are directly linked to the homepage (for example, the categories on many sites). Subsequent depth levels follow the same system as between Levels 1 and 2; for example, Level 3 includes the URLs linked from Level 2, and so on. The bar lengths indicate the number of pages included in each level and the color if the degree of LevelStrength (a measurement equivalent to the level’s Pagerank) is good or bad (sufficient or insufficient). All levels should appear in green for adequate link juice flow, with values equal to or greater than 85. If, for example, you see a level in red, you should click on it in order to see which pages are involved, thereby identifying the most problematic pages at a glance in order to analyze them and fix the problem. Problems are often easy to solve, but difficult to identify. 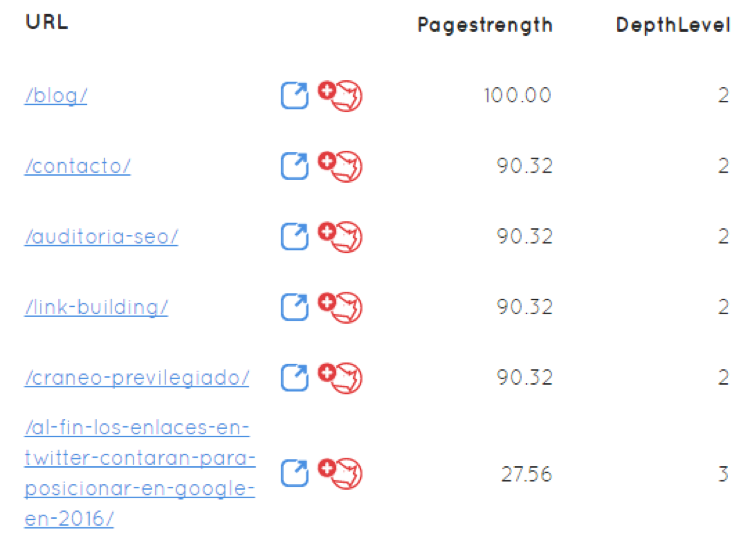 Most powerfull pages: These are the most relevant pages within the website, or those with the highest PageStrength (equivalent to PageRank), listed in order from most to least relevant. The most relevant URLs for your business should therefore appear at the top of the list; if this is not the case, the website architecture should be modified in order for those URLs to achieve a higher PageStrength to help improve their ranking. It is interesting to compare the PageStrength data with the depth level data to the right, as you might occasionally be surprised (for example, you might find pages with PageStrength 100 at Depth Level 4 when the average for Level 4 is 0.15). Common Internal Anchors: These are the most common internal anchors between pages within a domain. This shows you the anchor text and how many times it is repeated. If you click on the anchor, it will take you to a list of all the URLs that include this anchor and the number of times it appears in those URLs. You can also see the LinkStrength data (comparable to the Pagerank) for the link containing that anchor text in specific URLs (which is very interesting if, for example, you want to change anchors in order to strengthen certain URLs since you can see which links would be the most relevant, and within which URLs). This section is important since you might be repeating anchor text that may not be in your best interest while not using other anchors that would be more advisable for positioning specific parts of the website. 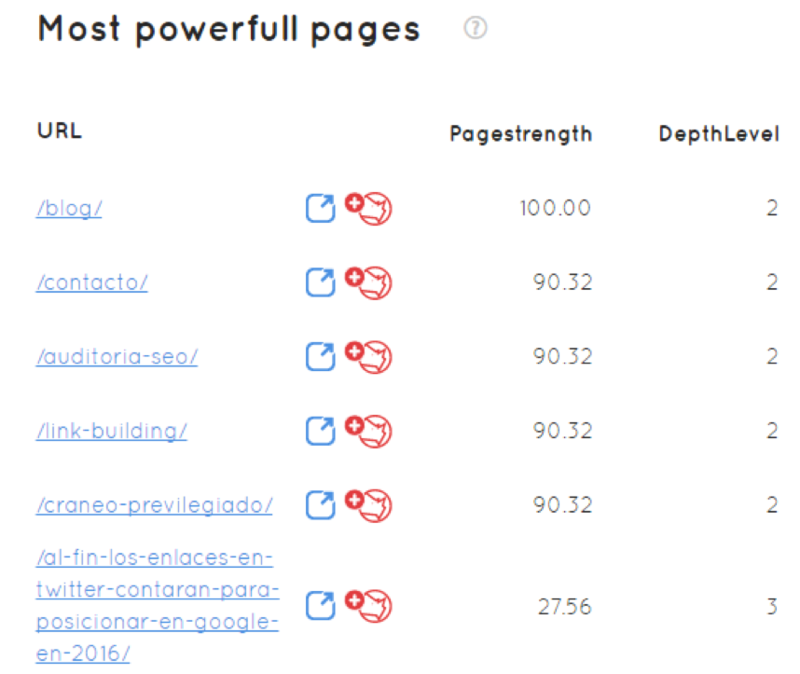 Most powerfull Anchors: These are the most relevant internal anchors between pages within a domain, meaning the anchors that have the overall highest LinkStrength (comparable to Pagerank). If you click on these, you will see a list of anchors in order of LinkStrength, as well as the URLs that include that anchor text and how many times they are repeated. It is important to note that the most common anchor texts are not necessarily the most relevant.